Halcyon Drives are a proud founder member of the ABB Drives & Motor Alliance networks, which offered the most comprehensive inverter drives and ac motor network in the UK. 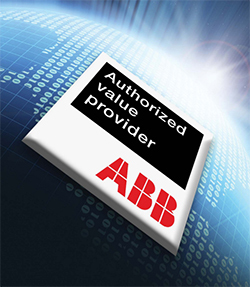 January 2014 saw the launch of the ABB Authorised Value Provider (AVP) network; an amalgamation of ABB’s UK variable-speed drives and electric motors networks into a single brand identity. The Authorised Value Provider raises the bar in sales, support and services for drives and motors across the UK, providing up-to-the-minute technical advice, rapid product delivery and a portfolio of life cycle services such as energy and productivity appraisals, installation, start-up and preventive maintenance. Our continued accreditation in the new AVP network demonstrates our in-depth knowledge of local markets, ABB’s selected products & services and the commitment to our customers in delivering the high standards required as an ABB Authorised Value Provider. What does it mean to be ABB Authorised? Halcyon Drives are fully ABB trained and continually audited to ensure we meet the high and consistent globally recognised standards for customer sales, support & services. Only companies meeting ABB’s high standards can carry the official AVP logo for specific product and services.